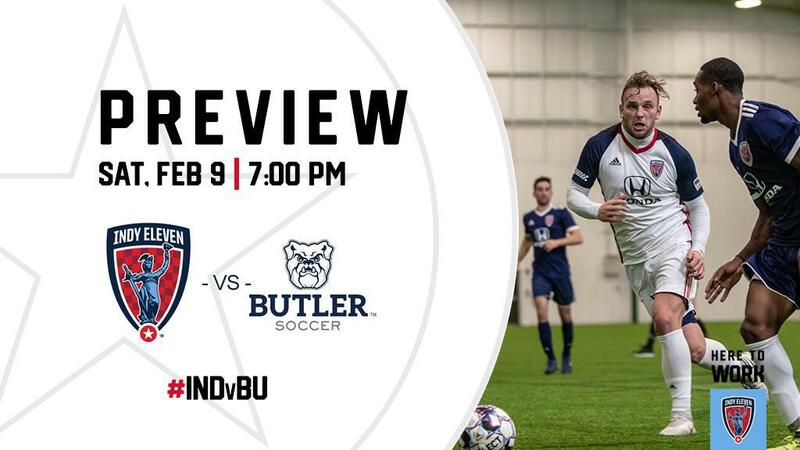 Indy Eleven will kick off its 2019 preseason campaign against Butler University Men’s Soccer this Saturday, February 9, at 7:00 p.m. This marks the fifth time in the last six seasons that Indiana’s Team has taken on the collegiate side in a preseason matchup. Indy Eleven begin preparations for the 2019 USL Championship season after ending last season with a 13W-11L-10D record. The Boys in Blue tallied 45 regular season goals and kept their goal line clear on 11 separate occasions. Indy’s inaugural USL Championship performance earned the team a USL Cup Playoffs berth, which ended in the Eastern Conference Quarterfinals against Louisville City FC. Indy Eleven Head Coach Martin Rennie has retained several familiar faces from last season’s squad: goalkeeper Jordan Farr; defenders Ayoze Garcia and Karl Ouimette; midfielders Tyler Pasher, Nico Matern, Matt Watson; and forward Eugene Starikov. The returning players were responsible for a combined total of 15 goals and 16 assists last season. Indy’s roster features several new high-profile signings. New in Blue this season include 2018 Golden Glove recipient Evan Newton (GK), USL Championship all-time leading goal scorer Dane Kelly (FW) and 2018 USL Championship MVP finalist Thomas Enevoldsen (FW). Additional key signings include defenders Paddy Barrett, Macauley King and Lucas Farias; midfielders Kenney Walker, Tyler Gibson and Neveal Hackshaw; and forward Ilija Ilic. Butler University returns to action this Saturday as the Bulldogs prep for a busy spring season. Butler Men’s Soccer finished their 2018 season with an overall 4W-12L-2D record, scoring 26 goals on the year. Senior Brandon Guhl (FW) led his team in goal scoring, netting seven goals in 18 appearances. Saturday’s preseason matchup is a Season Ticket Holder exclusive event. Don’t miss out on any of the action this season. Fans can get their 2019 Season Ticket packages starting at $99 at IndyEleven.com/Season-Tickets or by calling 317-685-1100.